The history of the Ferrero Group is a story of success in its third generation, in which the development of a multinational company perfectly combines with the past, present and future of a tenacious Piedmontese family. The Ferrero family was the first Italian manufacturer after World War II to open production sites and offices abroad in the confectionary sector, turning the Company into a truly international Group. Today, Giovanni Ferrero continues to run the Company successfully, aiming to reach goals that are even more ambitious and keeping alive the company inspiration and social motivation that was so strongly shared with his father Michele and his brother. Today, just like yesterday, it is a structure based on solid family values. Ferrero invites the international community of Desall to suggest a new interior design project to furnish the rooms dedicated to the employees working on the production line, creating a space dedicated to relax, break and nourishing relationships among colleagues, where everyone may find the ideal place to refresh, relax and possibly have a snack before going back to work, with a project that may fully reflect the founding values of the group. Objective of the contest: your project shall include several furnishing elements and solutions able to adapt to the various dimensions of the relax rooms available inside the Ferrero facilities, in particular those rooms located next to the production lines, reserved to the line workers. The rooms shall contribute to improve the working environment, where every line worker might feel welcome and at ease, in a lively and cosy context. Values to convey: the furnishing solution you are going to suggest shall reflect the Ferrero values and identity, that considers loyalty and trust, respect and responsibility, integrity and moderation, the founding values of the group. In addition, other very important values include passion for quality, research and innovation, that were embodied by a very successful entrepreneurial experience. For more information, you may refer to the institutional websites of the group. Each room has at least two glass walls – one of which always facing the production line – and at least one masonry wall. At your discretion you might evaluate whether to cover/coat/furnish the various walls as you prefer. Access to the room is provided through a door located on the glass wall facing the production line. Given the great variety of the rooms available in the production site, keep into consideration that in some cases rooms might exceed 300 cm height. Room purpose: the rooms reserved to the Ferrero line workers will be mainly used for 10-15 minutes working breaks, during which every person will find the ideal place to relax, have some snacks, stay informed about contents and events concerning the company or to other contexts and to nourish relationships with the other colleagues. Capacity: according to its size – small, medium, large – every room will have a capacity of 4, 8, 12 people respectively. The total number of line workers for each production unit amounts to about 50 people, who will take turns using the adjacent room for the working break throughout their working shift. -	1 modular wall system: including also a bulletin board – on which the workers may hang flyers, notes, notices, etc. – and other elements of your choice. Generally, the wall system will be installed on the larger masonry wall. -	Table + chairs, that may accommodate the maximum number of people the room can host, for facilitating the food consumption during the break. For this purpose, keep into consideration that the furnishing elements you suggest shall be configurable according to the room dimensions. -	Chairs/settees for relaxing; take into consideration that the furnishing elements you suggest, shall be configurable according to the room dimensions. -	1 area on the wall for hanging company posters, with contents concerning the Ferrero values and products. -	1 wash basin, for example to allow workers wash some fruit etc. -	at least 1 vending machine (only in the large room). In addition to the items described above, you are free to suggest other furnishing elements of your choice. Modularity: the wall system and the furnishing items shall allow a modular composition, so to be easily adapted to the different-sized relax rooms available in the Ferrero facilities (small room, medium room, large room), while ensuring a stylistic continuity between the various spaces. In order to keep the costs down and focus the attention on the space layout, you are preferably invited to look for furnishing items already available on the market, exploring a modular or combinable approach. Otherwise you may decide to suggest furnishing items of your conception, inspired by the Ferrero values. At all events, both for the already existing furnishing items and for the furnishing items of your conception, make sure they fully satisfy the workers needs and they comply with the identity, style and values of the brand. Materials and eco-friendliness: a very important aspect of your project regards the ease of cleaning and the durability of the furnishing items, with a special attention to environmental issues in the choice of the materials and of the finishes. Interactive and technological elements: the rooms shall represent the ideal space where every worker may relax and stay informed. For this purpose, each room will be equipped with one or more displays broadcasting company-edited content, with a reach variety of programs and tv specials. You are free to suggest other elements, including for example interactive totems, music corners or corners where listening to the content broadcast on the displays. Room lighting: the rooms will be lit exclusively with artificial light; you are free to suggest your own lighting concept aimed at making the rooms cosy and relaxing, depending on your project idea. Style: you are free to use the style that best matches your project idea, provided you comply with the identity and values the brand represents, including, for example, moderation. Cost estimate: in order to allow a better evaluation of your projects, you are invited to include a rough estimate of the costs for the realisation of the three room-typologies specified above (for ex. costs of the furnishing items, costs of the technological elements to install, etc.). -	summary slide with more information about furniture, finishes and claddings (optional). If necessary, we remind you that you can also attach a .ZIP archive containing extra materials. Participation is free of charge and open to designers and creative talents of any nationality aged 18 years or older. Participants can present one or more projects, but only the projects published on the www.desall.com web site, via the upload page related to “Ferrero – Design the working break” will be accepted. The selection of the winner by Ferrero will be the result of an unquestionable evaluation and it will take into account originality, feasibility and consistency with the brief presented. For the duration of the option right, the Sponsor offers an extra chance to all participants setting a fee of Euro 3,000.00= (three-thousand/00) for the purchase of the license for the economical exploitation of the projects not-acknowledged as the winning proposals. 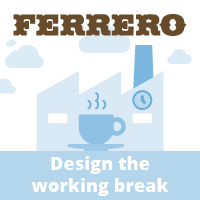 Do you want to stay updated about "Ferrero – Design the working break"?